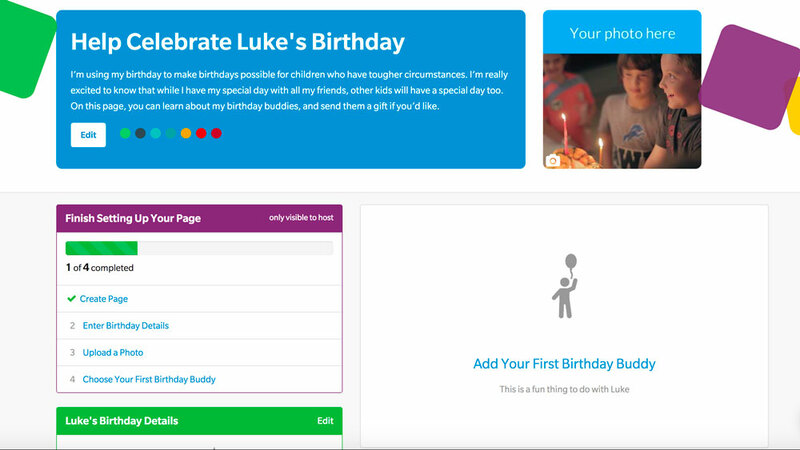 Your digital birthday page is where your party guests can read about the party, RSVP, and send a gift online to children in need you’ve chosen to help. 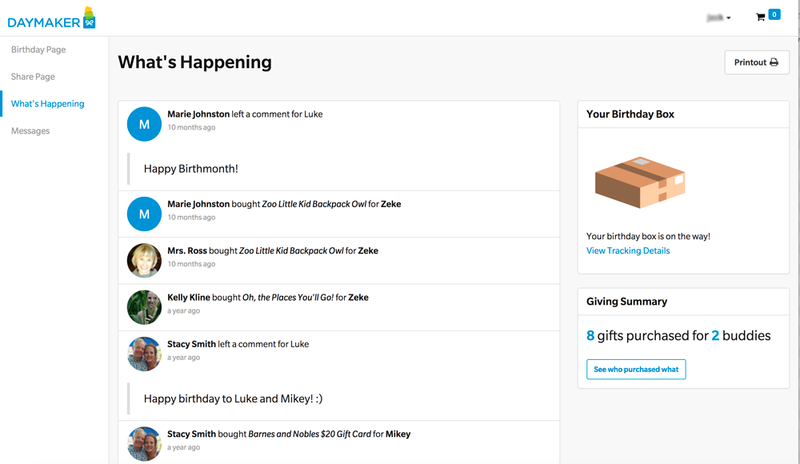 Is a birthday page the same as an online invite like Evite or Paperless Post? Yes. A Daymaker page works like an Evite or Paperless Post does. 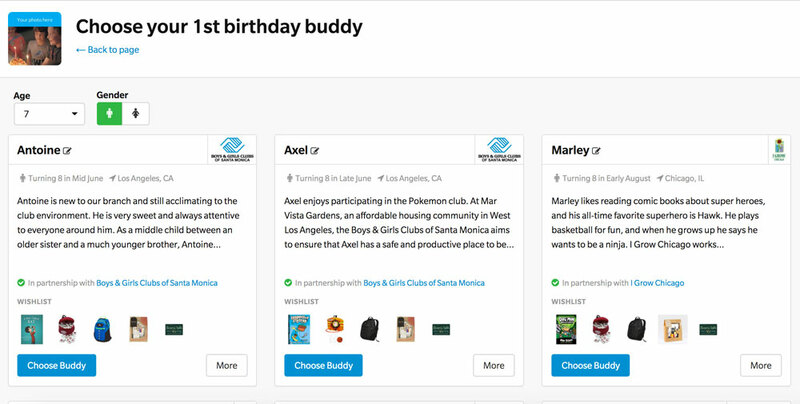 In addition to the invitation, guests can learn about the buddies you’ve chosen to help and can donate a gift while RSVPing. Can I use Daymaker for birthday parties of any size? Absolutely. We’ve had parties ranging from small sleepovers to picnics of 100+ kids. There is no limit on the number of buddies you can help through the course of your party. Is Daymaker only for kids’ parties? While our focus is on providing a fun and engaging giving experience for kids, we’ve had people of all ages (kids at heart!) create pages and invite friends. Does it cost me anything to use Daymaker? Not a penny. We’ve created partnerships with manufacturers so we don’t have to charge the host, the guests, or our nonprofit partners. Let us know if you’re using Daymaker to invite guests to your party OR if you’re using another invite site for RSVPs. Then, customize your page by uploading a photo, choosing a color theme, and writing a message to guests. What if I’m using another invitation site? That’s fine! Make sure to choose option 2 when entering your birthday details. What if I’m not having a party? That’s fine as well! Choose the 3rd option when entering your birthday details. Do I have to enter party details? If you are using another invitation method or are not having a party, you do not have to enter any type of party details. Choosing your first buddy is a great opportunity to empower your child to make a meaningful decision. Where do buddies come from? We partner with 501c3 organizations around the country that work directly with kids dealing with difficult circumstances. In many past situations, our buddies have gone without birthday gifts or much-needed items like books, backpacks, and educational toys. Can I select multiple buddies? You can. Once your current buddy has 2+ gifts purchased from his/her wish list, we allow you to add another buddy. In the case the wish list is fulfilled before you can add another, we’ll add one automatically so guests can continue to give. Are the wish lists actual products? You bet. We work with manufacturers from around the country to find products that fill needs while creating a special feeling for our buddies. These products are shipped from our warehouses directly to the nonprofits. How many items are on each buddy’s wish list? Each wish list will typically contain 4-6 specially selected items. We want to help you help as many kids as possible, and we’ve found that ~5 gifts is the perfect number for buddies to feel special and celebrated. Once your page is complete, invite all of your guests and friends, and then the magic begins to happen. What does it mean to invite? What does it mean to share? If you have all of your party guests’ emails, we will send an email invitation on your behalf inviting guests to visit the page. If you’d like to share the link to the page on your own, you may do that as well. If I’m using Daymaker to send invites, can I preview the invite? Where can I track invitations and RSVPs? You can do this in the Invitations or Share tab in your birthday navigation menu. Do people have to RSVP on the page? If you’re using another invitation site or not having a party, guests do not have to RSVP. We’ll automatically turn that off if you select option 2 or 3 when entering your birthday details. Party guests visit your page, RSVP, and can send a gift to your buddy in just a few clicks. How do guests send a gift? We like to think we’ve made it as easy as online shopping. 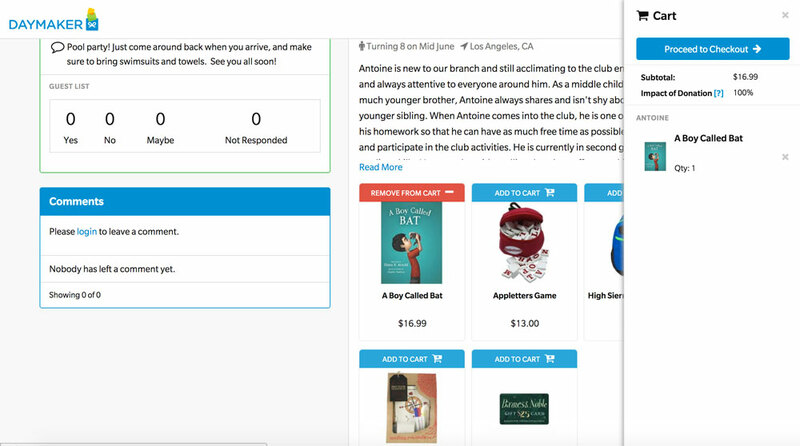 After learning about the buddy and the nonprofit, guests can add an item to their cart, enter payment information (or use PayPal), and the gift will be on its way. No. Standard shipping and tax will be applied, but we do not charge a fee from Daymaker. How do we know if the gifts made it? Every donor can track the status of their gifts in their donor profile and will be notified when the gift has arrived at the sponsoring nonprofit. 6) Keep track in "What's Happening"
You can visit the "What's Happening" page to see who’s purchased gifts, left comments, and view any notifications from Daymaker. How can I manage invitations? You can see RSVPs, track opens, and send more invites by visiting the “Invitations” page right above "What’s Happening." Can I use "What's Happening" to keep my child updated? Absolutely. We’ve found that kids love tracking all of the giving and comments from guests. "What's Happening" is a great place to help them feel celebrated. Can I message my guests?